There’s a paradox running through teen movies. While they’re often most enjoyable when first discovered as a kid relatively close to the characters’ ages—if not the actors’ ages (I’m looking at you, Spader… and every other 1980s actor)—they so rarely capture what it feels like in the moment during those chaotic and vulnerable years. Instead there’s almost a prolonged sense of l’esprit de l’escalier powering the plots: an entire industry of outcast writers getting their just deserts, without reality getting in the way this time. 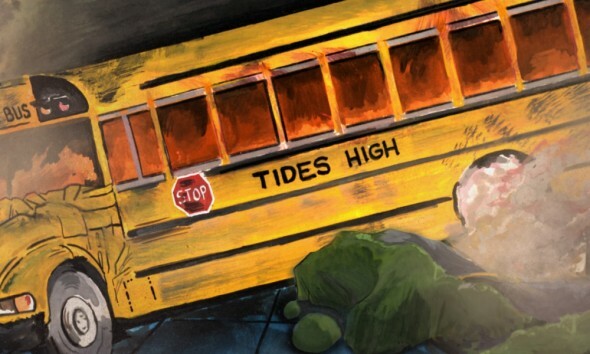 What’s so refreshing about My Entire High School Sinking Into the Sea is that not only does writer-director and comics artist Dash Shaw avoid that paradox, he does it through some of the most inventive and absurd art to be seen in any recent animated film, with a tactile humanity that can hold its own against Pixar. Shaw keeps the action tight and focused with a quick setup that lets the comic stars riff while the world around them falls apart: best friends Dash (Jason Schwartzman) and Assaf (Reggie Watts) start their sophomore year at Tides High School looking to make a big splash writing for the school newspaper. Fellow classmate and editor at the paper Verti (Maya Rudolph) is looking for more than just news copy from Assaf, and this tension fractures the trio just as an earthquake threatens to plunge the poorly built school into the sea. The dialogue is cute, with lots of throwaway non-sequiturs helping to keep the movie surprisingly cheerful for what’s basically a mass casualty event with children. And the Verti-Assaf courtship will ring particularly true for any extracurricular misfits in love. But more than anything else, it’s the artwork that takes the movie from good to great. Shaw uses deceptively simple figures for the characters, which lends a sharp contrast to the lush and ever-changing backgrounds. As Dash, Assaf and Verti battle external and internal forces to make their way out of the sinking school, the scenery rapidly veers from Impressionistic canvas to disjointed scrawls—and with textures that feel more alive than the 3D in any superhero movie. The chaos of the set pieces ebb and flow with the trio’s journey of self-discovery, and Shaw delights in creating kaleidoscopic homages to 1970s disaster movies. At heart, though, it’s also a teen movie—with an unsubtle reminder for adults that the bar for what feels like the end of the world is very different but no less serious when you’re a kid just trying to find your way in the world.